What is advancing educational leadership? 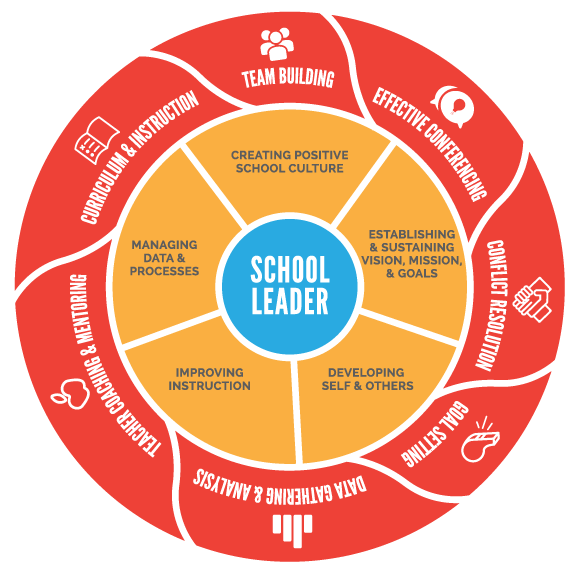 Now more than ever, effective school leaders are critical to successful student outcomes. With the implementation of the Texas Teacher Evaluation Support System (T-TESS), administrators in Texas must support the implementation of impactful strategies that provides support in the implementation of impactful strategies designed to improve instruction and student performance at the campus and district level. Administrators must be knowledgeable in curriculum and instruction, must be skillful in data gathering and analysis, must be able to set goals, must be skillful in conducting effective conferences, must have team-building skills and conflict resolution skills, and have mentoring and coaching skills. In order to meet these expectations, the Texas Education Agency and ESC Region 13 have developed Advancing Educational Leadership (AEL). This three-day engaging and research based training is required for teacher appraisers along with T-TESS evaluation training. This three-day engaging and research based training is required for administrators utilizing the T-TESS rubric to appraise teachers. Purchase Your AEL Participant Guide Today! Attention, Vision and Mission Skeptics!